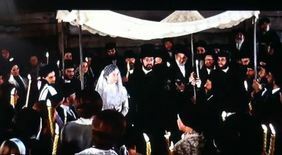 This is a beautifully sung marriage procession from the movie: Fiddler On The Roof features the song lyrics of "SUNRISE SUNSET". Fiddler on the Roof is a musical , which was loosely based on Tevye and his Daughters (or Tevye the Milkman and Other Tales). It was created by Sholem Aleichem. It opened in 1964, with the premise of it being the original Broadway show .It was the first musical theatre run in history to exceed 3,000 performances. Fiddler held the record for the longest-running Broadway musical for almost 10 years. However, Grease managed to surpass its run. It was nominated for ten Tony Awards. It won nine of them This included Best Musical, best score, book, direction and choreography. The story's theme focuses on Tevye, the father of five daughters. He attempts to maintain his family and Jewish religious traditions while outside influences encroach upon their lives. His three older daughters are strong willed in their actions. —each one's choice of husband moves further away from the customs of his faith- Also, he must deal with the edict of the Tsar that evicts the Jews from their village. Golde: Iz dos mayn meydele, dos kleyne? Iz es dos yingele ikh zey? Tevye: Git nor a kuk vi shoyn dervaksn zenen zey! Golde: Ven iz zi azoy sheyn gevorn? Ven iz er oysgevaksn hoykh? Tevye: Ersht nekhtn hobn zey geshpilt in hoyf! Bokherim: Tog ayn tog oys, tog ayn tog oys, dos iz undzer loyt! Meydlekh: Tog ayn tog oys, tog ayn tog oys, dos iz dayn basher! Loyfn di yorn nokh anander, trogn zey freydn mit a trer. Golde: Zol ikh mit eytses zey farzorgn? Zol ikh zey helfn efsher, zog? Tevye: Got helft zey yedern frimorgn, tog bay tog. Pertshik: Zey zeyen oys vi naygeboyrn. Hodl: Punkt vi a nay porfolk zet oys. Pertshik un Hodl: Iz nokh a khupe do far undz nor bloyz? Ale: Tog ayn tog oys, tog ayn tog oys, dos iz dayn basher! Under the canopy I see them, side by side. Soon the full circle will have come to pass.